The Flemish League Against Cancer is organising another 1000km bike ride to raise money in the fight against cancer in May 2015. 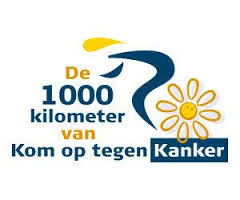 1000 kilometer van Kom op tegen Kanker have invited the EUCG to consider entering a team for the event. Eight EUCG members could be willing to form a team to take part in this challenging, exhilarating event. Each cyclist in the team will need to cycle 125 km over the course of four days, and raise a 5000 EUR registration fee, all of which will be donated to Kom op tegen Kanker. In May this year, the event was a huge success: about 3 000 cyclists in 527 teams, raising over 2.6m EUR! Participants use racing bikes and ride in pelotons, accompanied by safety guards and repair services. Knowledge of Dutch is an advantage – but not mandatory.